These are reactionary times. These are times when events are explosive and unexpected. Protest politics are back, pitting people power against intransigent institutions. Earth events send shock waves of fear and empathy around the globe. Solar flares wake up a quiescent sun. Financial dramas large and small are the order of the day. Acts of violence know no bounds. There’s high drama on the high seas of the human adventure; when we don’t have time to adjust, all we can do is react. The negative political fervor that showed up in the 2010 election is playing itself out in wild ideological grandstanding that threatens to paralyze the system. We have no idea where any of this is going. A recent meeting of earnest, concerned local residents investigating the topic “collapse” was visited by a delegation from Santa Rosa, three tightly wound crusaders rooted in fear-based survivalist political activism. That was strange! The cartoon image of the bearded man in robes carrying a sign reading “The End of the World is at Hand,” is no longer a cartoon. 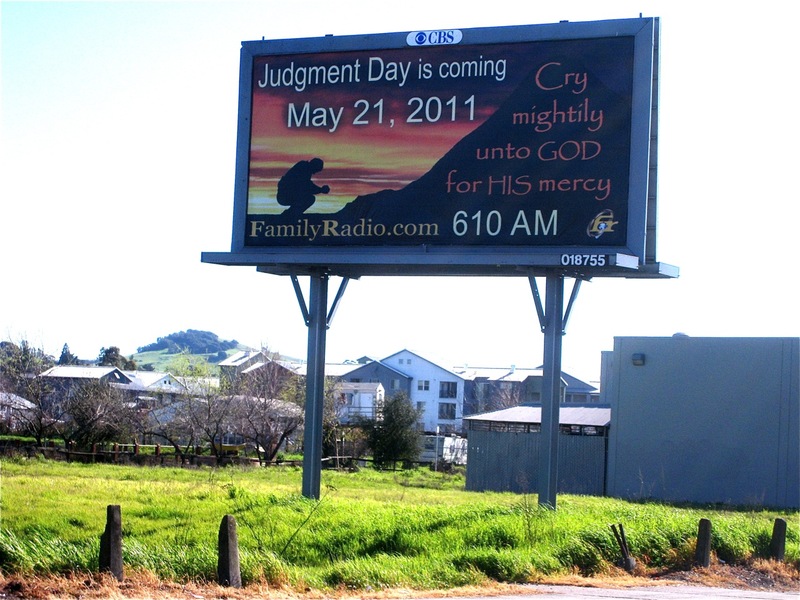 It’s a billboard on D Street in Petaluma. Like it or not, we are in the thick of the “End Times” emotional roller coaster. Inevitably, we are going to react to what we see around us that is strange and threatening. We are going to fall into patterns of judgment and blame and outrage. We are going to demonize the “enemy” (Gov. Scott Walker and his buddies the Koch brothers for starters) and romanticize our allies. We are going to become mirrors of everything we see wrong in the world around us as the world around us becomes an uncomfortable place run by moral indignation. We do this because we still live in the small realm of our limited understanding of what this time is all about. We think we are a lonely little planet populated by a species that can’t organize itself and in a way that creates benefit for all. As the kids say on Facebook: Earth: FAIL ☹. Naturally, that leads to a bummer state of mind. From the bummer state of mind comes the anger and the bully mind and the fanaticism—and the possibility of social chaos on a scale none of us want to imagine. Maybe it would serve us better to realize that we are not inherently unable to cooperate and live in balance with our biosphere, but shackled by beliefs and conditioning that corrupt our intrinsic nature. It is these false beliefs and corruptions that are being cleaned out by the waves of change coming at us. If we cling to them, we’ll go with them. If we let them go, we’ll be free. Belief number one is the reality of money. Money is a measure of scarcity. Nature and the vast universe reflect pure abundance. All the man-made, artificial economies are failing because the end of money is at hand. What lies ahead is an economy of abundance and love. Our mission in reactionary times is to imagine that economy into being. Belief number two is slavery to mechanical time and a political/economic calendar. Time is a dimension of synchronicity, a radial present in which all possibilities exist. Time is a dimension of consciousness. The role of a calendar is to connect us to the cosmic synchronic order. Our mission in reactionary times is to contemplate these ideas and integrate them into our daily lives as best we can. Belief number three is the worship of technology. Technology is trap. It will enslave us even as it appears to liberate us. The technology of the next age is mental, not physical. Applying it requires disciplines of mind and body that are joyful and life giving. These are the anchors of the culture to come in which humans interact in art and play. Our mission in reactionary times is to begin these disciplines now and infuse them into society at all levels, from childhood to elderhood. What is coming has been foretold in every cultural tradition on the planet. First comes the purification, then the realization of a Golden Age of peace and harmony. We were born to be a part of the birthing of a new age of humanity. We picked up some clues of our true purpose in the psychedelic era; we buried them in our re-embrace of materialism in the technological era. Now we can rediscover what we have always known: we are in the right place at the right time.